Established in 2003, these six Canadian musicians have been stunning audiences with a true experience of southern rock music and the original artists. This band has passion, plain and simple, as demonstrated in every performance. The members have dedicated themselves to accurately reproducing the music and the spirit of an undying era and the hard work has certainly paid off. Southern Fried is meant to be seen and heard. They are the type of band that provides you with a Live experience of Southern Rock. 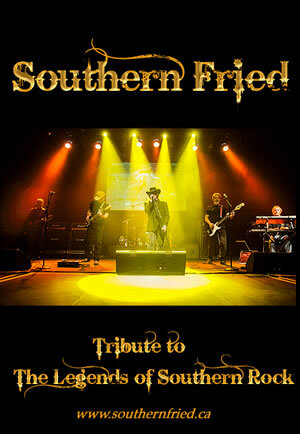 Being hailed as simply the most authentic sounding Lynyrd Skynyrd tribute anywhere doesn't come as a surprise! The band has become a fan favourite at fairs and festivals across the country, pleasing audiences with hit after hit all night long. **Warning ..This music may cause foot stomping, booty shaking, hip gyrations, spontaneous sing alongs...and in some cases, a desire to consume Jack Daniels has been reported!